On the 30th of October 1972, Gerald Genta (then having an important assignment for Audemars Piguet) filed a patent in the United States for his master piece, the Royal Oak. From what I read, he already documented this design in Switzerland on the 6th of December 1971. As you can see in the drawing below, is that the famous bezel screws of the Royal Oak are not aligned in the ’round’ direction of the clock. Perhaps it did not matter for this patent registration, or it has been done on purpose to show that the screws would actually work. This drawing should be reflecting the first AP that made it to the flesh, the ref.5402ST a.k.a ‘Jumbo’. 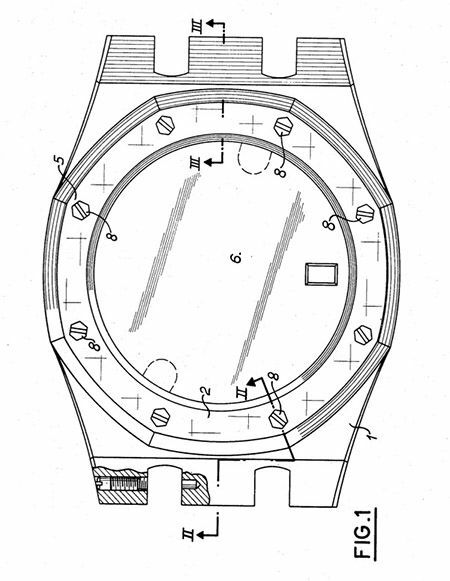 The patent of Gerald Genta/Audemars Piguet is easy to find if you google the number, however, using this link you can see the whole document including a few interesting pictures.